I am very lucky that way, I have a husband who is in love with Bengali food.. Tuesdays are vegetarian for us, so I fished out some old recipe cards, endless phone calls and finally got that Aloor Dum with hing.. A traditional potato curry with asafoedita and bay leaves… This is something my mum used to make and a kid I remember she would serve them with those precious white beauties, Luchi or puffed flour pancakes.. Well I have left luchi for some other time.. 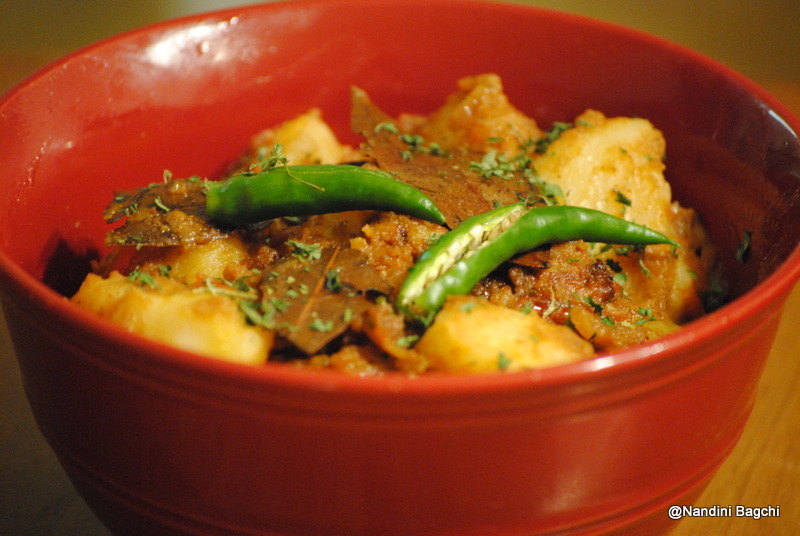 But Aloor Dum was a major hit and the husband lapped it up…. Potatoes/Aloo – 12-15 if you are using the baby potatoes or otherwise 7-8 medium sized ones cut into halves, a host of spices. In a boiling pot or pan, bring water to a boil with little salt, I used a pressure cooker, A must have for an Indian Kitchen, Add water and put it on the Gas for 1 steam on high heat, then bring the heat down to about medium and leave it for 2-3 steams and then turn the heat off completely… let the steam escape and open it.. the potatoes should be good and soft..Peel the skin as it is easier to peel after the potatoes are boiled. Heat Oil in a Frying pan/Kadhai and add Bay Leaves and Asafoetida. Add the Onion paste and fry till the onion turns a pinkish brown and then the tomato and sauté till the tomato is nicely integrated with the onion. Add the Ginger Paste or grated ginger. Take the remaining spices and them up in a bowl i.e. Mix the Cumin Powder, Garam masala Powder, Red Chilli Powder with the yogurt along with the chaat masala and add to the Frying Pan. You may remove the frying pan from the flame, so the spices do not burn. Sauté the masala till you see the oil separate from the masala. 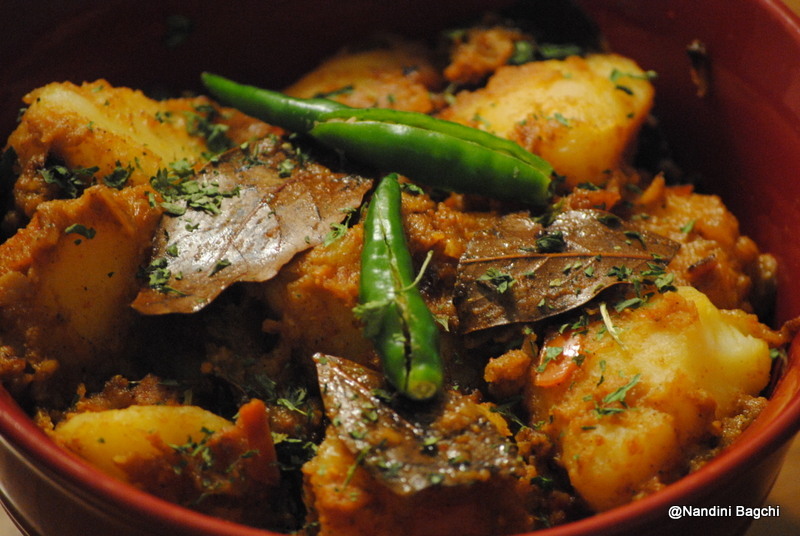 Add the potatoes and mix well with masala.Add little water and salt and cook till the water almost dries up to give way to a moist gravy which will be slightly dry and the masala will nicely coat the potatoes. There you go.. Ma’s Aloor Dum…. ohh ! too delicious food …………..